A tale of derring do from 1650. I’m not really looking at his clothes although he has a nice pair of boots and ribbons on his unconfined breeches. 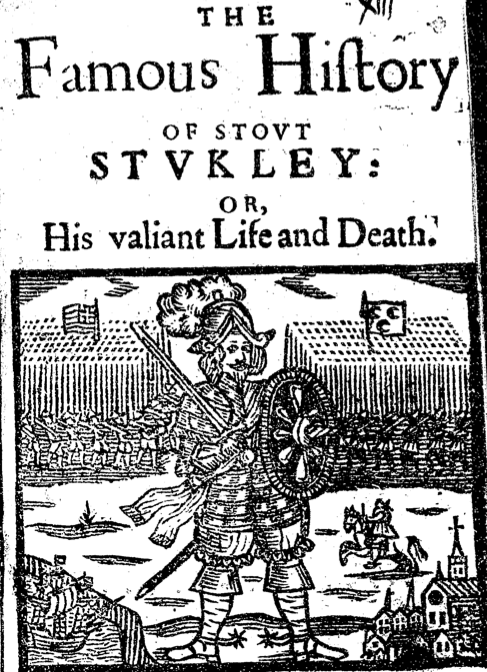 I like the battle scene in the background with two stands of pike flanked by muskets. Still what we have here is a nice little group of gentlemen in their smart end of the decade clothes, short tabbed doublets, felt hats, darted bands on their collars, tightly cut breeches and latchet shoes. 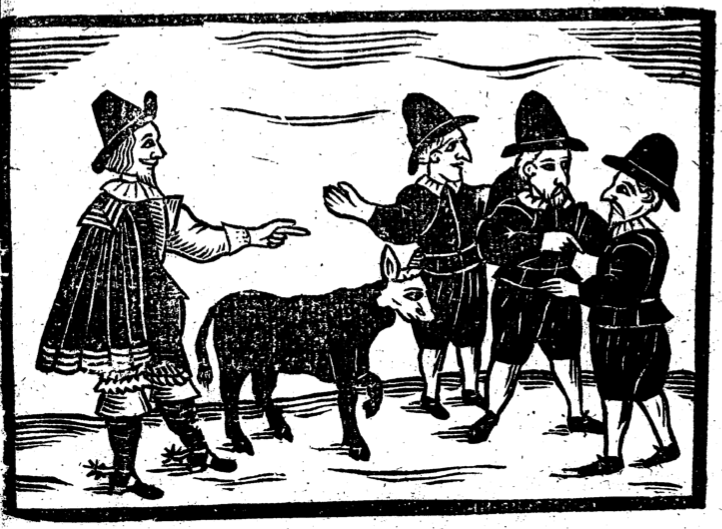 The gent on the left has a jauntily cocked hat and an off the shoulder cloak, boots and spurs. 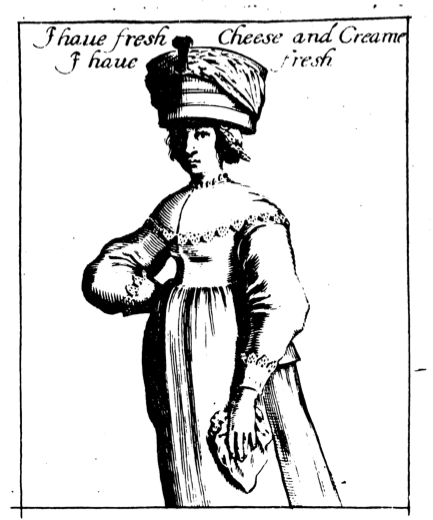 Two more images from The Manner of Crying Things in London 1640 that show to me that some women at least of a lower status weren’t wearing bodies to give them the fashionable straight lined body shape. I guess it was cheaper and probably more comfortable if you were carrying things on your head! Notice also that these street vendors have decorated their linen with lace. 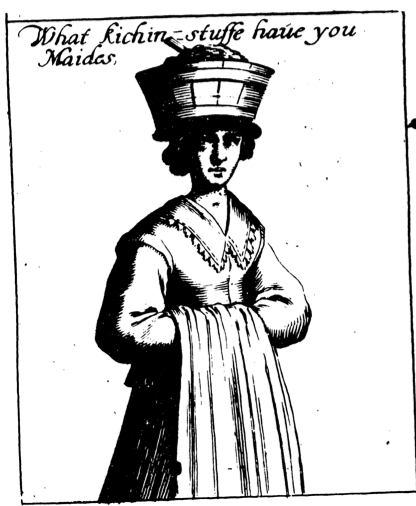 Some lace was very cheap in the 1640s. With a gun and his dog. Painted in 1650 by an unknown artist. 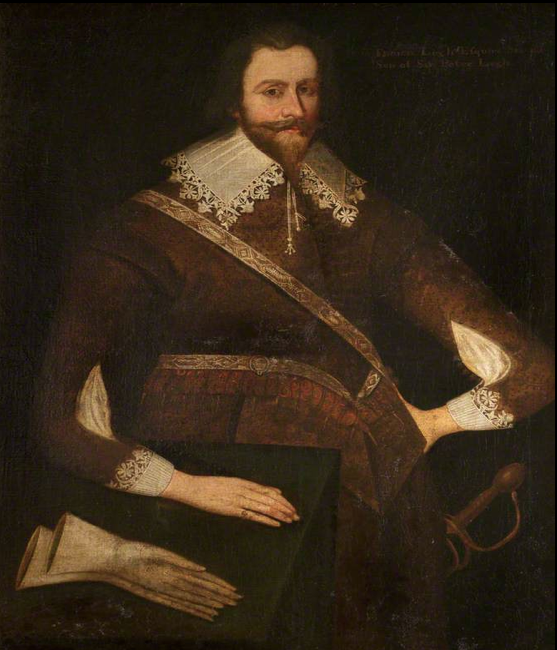 Not sure if he’s wearing a doublet or a buffcoat for hunting, but he has gold buttons on his cuffs and what looks like a linen bag hanging from a metal hook or loop on his hip for the critters he’s shot with his flintlock. 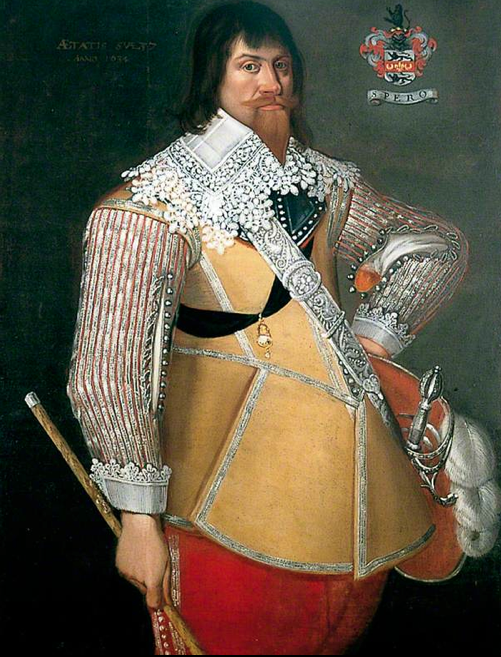 Rather fine lace edged cuffs for hunting and it looks like his falling band has been tucked into his doublet. He also has a rather odd line of buttons running down to his belt which don’t match the closure of the doublet. This picture hangs in the Royal Armouries galleries in Leeds. By Edward Bower the parliamentarian artist famed for his portrait of Charles I during the King’s trial in 1648. I can find nothing out about this picture except that it came up for auction a few years ago and was bought by a private collector. This rather serious pair are dressed in their finery for the picture. The boy wears a smart brown doublet and breeches with open sleeves with matching thread-wrapped bead buttons four of which have been left rakishly unfastened for his shirt to poke out. He has matching band and cuffs with a rather nice knotted tasselled end to his bandstrings. The lady wears a rather sombre black petticoat and bodice, picked out with red ribbons and a couple of expensive looking pearl strings. The layers of cutwork lace on her cuffs and neckerchief are particularly splendid. Sadly I can’t zoom closer on this painting to see details, but it’s a really nice naturalistic group from the 1630s with the King and Queen. Notice the King’s dwarf Jeffrey Hudson wearing the suit that he was painted wearing in the woods by Muytens here. William Herbert and his brother were known principally for sponsoring the first folio editions of Shakespeare’s plays. 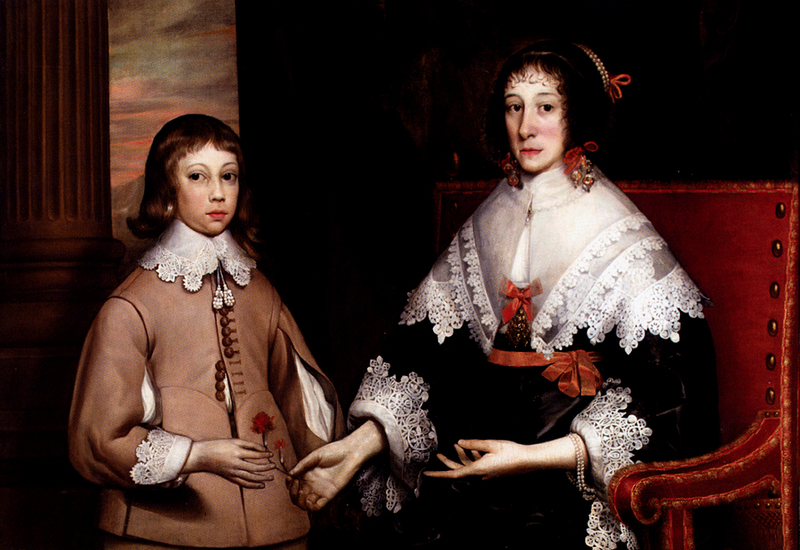 The picture is dated 1630-35, but probably the earlier date is correct as William died in 1630. His brother lived on to play a backstage role on the parliament side in the wars. 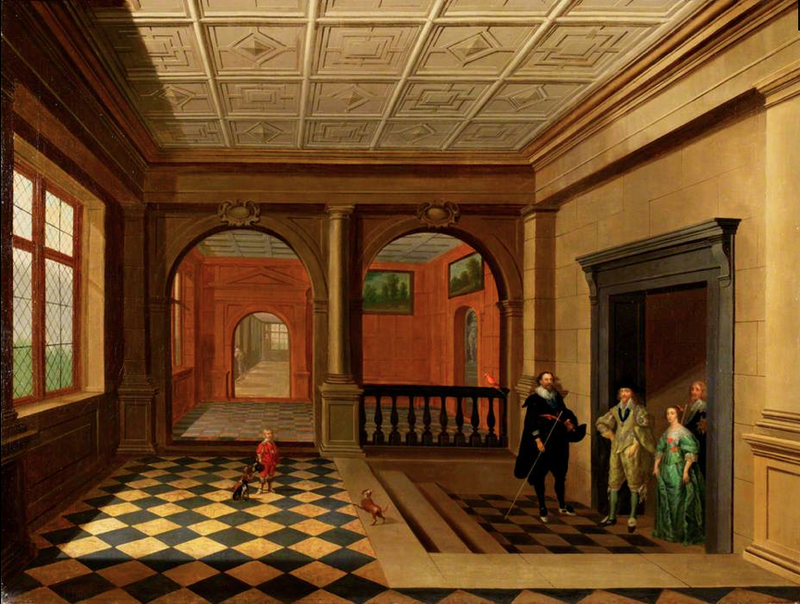 Picture is by Hendrick van Steenwijk and hangs in the Government Art Collection in London. 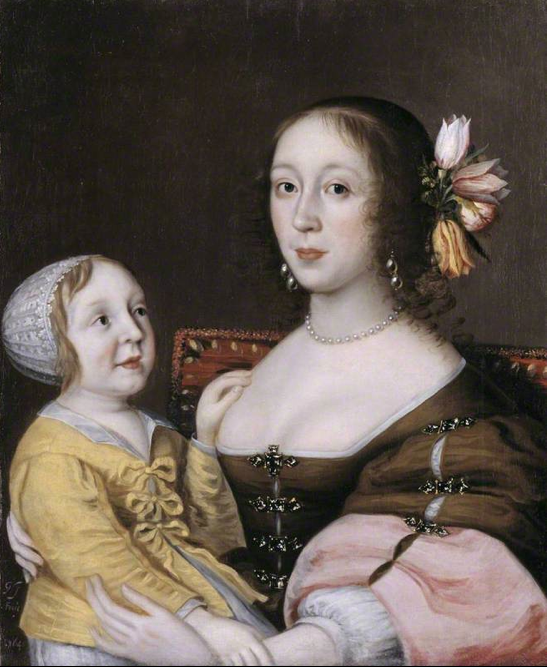 Painted in 1640 by Gilbert Jackson, this lady is thought to be Anne, wife of Richard Grenville. She wears a brown silk bodice faced with pink at the cuffs and fastened with some rather ornate hooks and eyes down the front and along her sleeves. There is possibly not much fashionable stiffening beneath as there are curvy outlines to be seen that wouldn’t be obvious if she was wearing a set of bodies or boned bodice. The gathered cuffs of her smock are visible below the turn-back of her sleeve. Notice also the tulips in her hair with the coloured streaks that just a few years previously would have made them very expensive accessories. The child who could be a boy or a girl wears a yellow doublet, practically fastened with ties, for quick removal if necessary, over a white smock and a nicely embroidered whitework daycap. Portrait hangs in the Tate London.